Supplementary material reads: "Prize winning sheep head speared by Billy Anderson, left, and Earl Rosekrans are held up by Norman Quast, president of the Aqua Explorers. Bob Jorden, right, was at pier to congratulate winners. Norman Quast, president of Aqua Explorers of Ventura County, showes [sic.] 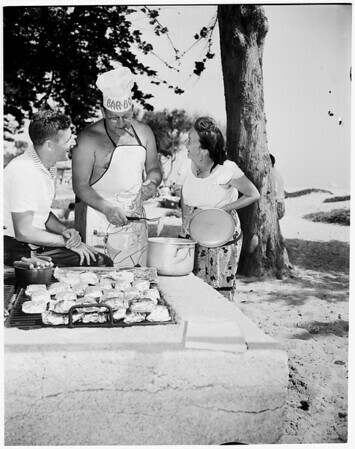 that he is a good cook chef as well as a skin diver as he barbecues abalone at Carpenteria Beach in Santa Barbara. Watching are Mrs. Quast and Don Miller. The occasion was part of a two day celebration in honer [sic.] of the clubs first anniversary. Skin divers are shown aboard Bud Wilbur's 'Marb 111' on sea outing to Anacapa Island in observance of their first anniversary of Aqua Explorers in Ventura. Hornshark speared by Bill Barada of Los Angeles is handed by rubber suited Barada to Bill Anderson of Santa Monica and Frank Smithland of Oxnard. WInning skin diving team of Warren (Doc) Sears right and John Hubb, seated, admire trophy while eating at fish fry in Carpenteria Beach in Santa Barbara. The two men speared the most fish in a two hour time limit. Mrs. Hubb and John Hubb Jr show proper family prid [sic.] in the trophy. Discussing plans of the best fishing spot on Aqua Explorers outing are Norman Quast, president of the club, Bud Wilber, skipper of the 'Marbo 111,' and Marton Saavedra. Quast and Saavedra are organizers of the Explorers. Wilber donated the use of the boat for the trip. Underwater fisherman are shown with spear guns used in catching fish on recent ocean trip by Aqua Explorers of Ventura County. In water are Bill Barada, Garry Hall and Clarence Brown. After spearing fish Tom Shaw of Los Angeles boards the boat where he is assisted by Bob Holbrook of Oxnard and Art Harris of Los Angeles. An unidentified underwater enthusiast watches".